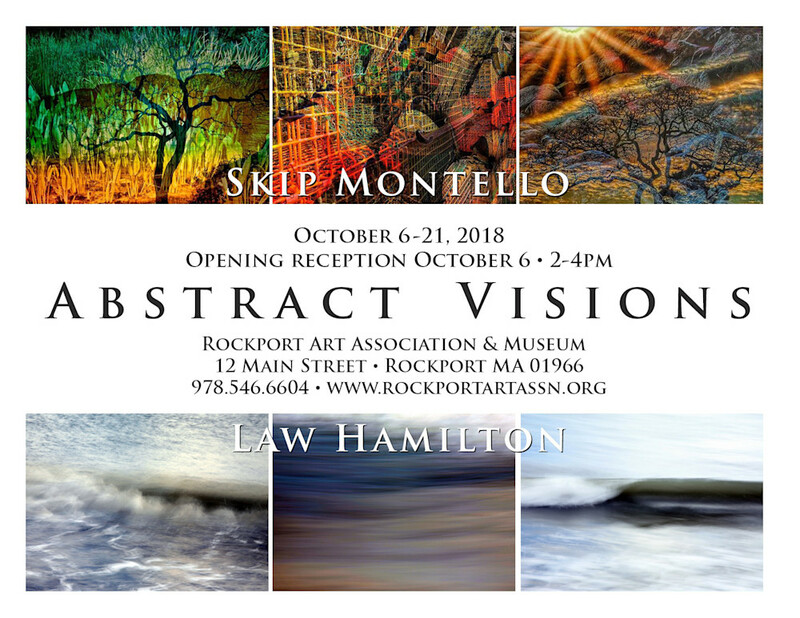 Abstract Visions – An exhibition of photographs by Law Hamilton and Skip Montello will open in the Marguerite Pearson Room of the Rockport Art Association & Museum (RAA&M) on Saturday, October 6th with an artist’s reception from 2 – 4 PM. The exhibition will be on view Saturday, October 6 – Sunday, October 21. Abstract Visions showcases many ways in which photography can be considered abstract based on natural experiences of the environment. Digital photography (camera and digital darkroom) bridges the gap between traditional photography (camera and darkroom) and other art mediums, creating a stimulating new art form while continuing to use the traditional concepts of color, form and composition. For Law, long exposures are like using the camera as a paint brush, blurring the motion of waves to create new patterns and textures in a single image. Keeping the shutter open throughout the cycle of a wave, shows the movement as the subject of the artwork. New landscapes and patterns appear and colors shift in tone and hue through this process. Other images without frame of reference continue to expand her definition of abstraction. For Skip, his ability to "see" and compose is based on perspectives - angles, distance, perch, light, color, patterns, reflections and image space. Subjects are coupled with Skip's own knowledge of the sky, earth and sea. Weather patterns, dew points, air temperatures, winds, sunrise or sundown, all provide the palette from which he creates a backdrop to a "sometimes serendipitous" choice of focal point. "What I see through the camera lens (and sometimes in my mind's eye) is what I strive to reproduce in the final image," said Skip. Law Hamilton and Skip Montello are both exhibiting artists at the Rockport Art Association & Museum and the Newburyport Art Association. They studied together at the Griffin Museum of Photography in the Atelier 23 program. Works printed on metal from Skip’s Quarry Reflections and Law’s Grace & Movement series will also be included in this exhibition.